Pick a pine tree from the lot – slim and tall, or short and squat! 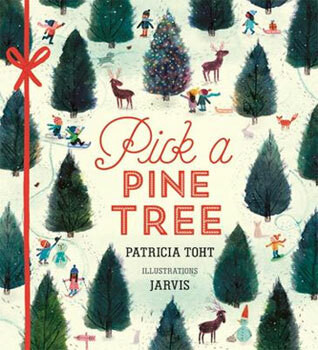 From Alan's Big, Scary Teeth creator, Jarvis, and author Patricia Toht, comes a beautiful, irresistible Christmas gift book that all begins with … picking a pine tree! Brimming over with the excitement of being with family at the festive season, a gorgeously rhythmical, read-aloud narrative accompanied by warm, joyful art celebrates all the familiar rituals of decorating the tree – from digging out jam-packed boxes of trimmings, stringing tinsel, to, at last, turning on those twinkly fairy lights. Patricia Toht once owned a children's bookshop called Never Never Land, before turning a love of books into a love of writing. She is the author of All Aboard the London Bus, illustrated by Sam Usher, and has contributed fiction, non-fiction and poetry to numerous children's magazines. She lives in Chicago, USA. Jarvis studied graphic design and previously worked as a record sleeve designer, website designer and an animation director before becoming a children's book illustrator. His books with Walker include Mrs Mole, I'm Home! and Alan's Big, Scary Teeth, which won the 2017 V&A Best Illustrated Book. About his picture book inspiration, Jarvis says, 'The way I work is always visual. I will have an image or character in mind and I pull a story out of it. I doodle and doodle and doodle until I get it right." Jarvis lives in Manchester with his wife and their dog and cat.